The Angels have claimed outfielder Brian Goodwin off release waivers from the Royals, Robert Murray of The Athletic reports (on Twitter). It’s not especially common for players to be claimed off release waivers, and Goodwin will technically have the option to reject the claim (as is a player’s right when claimed off release waivers), though there’s little reason for him to do so; because Goodwin is out of minor league options, the claim means he’ll likely join the Angels’ big league roster as at least a short-term option to help fill in for the injured Justin Upton. The Angels already have a full 40-man roster, so they’ll need to make a corresponding move to accommodate Goodwin. Goodwin, 28, went from the Nationals to the Royals in a trade last July and hit .266/.317/.415 output in 101 plate appearances with Kansas City through season’s end. Spring was a disaster for him, however, as he slashed .166/.188/.256 with 13 strikeouts against four walks through 49 plate appearances before being placed on release waivers Monday. He’ll now join Peter Bourjos, Mike Trout and Kole Calhoun in the Angels’ mix of outfielders while Upton mends a toe injury. Once the No. 34 overall pick in the draft, Goodwin is a career .250/.315/.454 hitter with 19 home runs and 10 steals in 502 trips to the plate. He’s a left-handed hitter who can handle all three outfield positions, and he could potentially be deployed in a platoon capacity with Bourjos in his new organization. 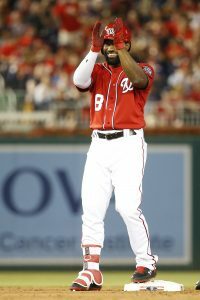 The Royals have acquired outfielder Brian Goodwin from the Nationals for minor league reliever Jacob Condra-Bogan, Washington announced. The Nats also recalled reliever Sammy Solis to take Goodwin’s roster spot. A National since they chose him in the first round (34th overall) of the 2011 draft, Goodwin never became a full-time player with the club. He debuted in 2016 with a short stint and amassed a career-high 278 plate appearances last year, when he impressed by posting a .251/.313/.498 line (105 wRC+) with 13 home runs, six steals and a stellar .247 ISO. Goodwin had difficulty in the outfield, however, as he combined for minus-7 Defensive Runs Saved and a minus-4.6 Ultimate Zone Rating. Playing time was harder to come by in D.C. this season for the 27-year-old Goodwin, who was stuck behind fellow lefty-swingers Bryce Harper, Juan Soto and Adam Eaton – not to mention the righty-hitting Michael A. Taylor – in the team’s outfield pecking order. Each of Harper, Eaton and Taylor missed time because of injuries in 2017, while Soto wasn’t even in the majors – all of which opened the door for Goodwin. With no clear path to action this season, Goodwin racked up just 79 PAs in his final run with the Nationals and batted .200/.321/.354. Along the way, he showed significantly less power (three HRs, .154 ISO) and raised his strikeout rate from 24.8 percent last year to 32.9 percent. Goodwin did increase his walk rate, which climbed from 8.3 percent in 2017 to 12.7, but that wasn’t enough to lift his offense to a respectable level. Because Goodwin’s out of options and superfluous to the Nats’ roster, the logical move was to deal him. The rebuilding Royals are apparently in position to take a chance on Goodwin, who won’t be eligible for arbitration until after next season and is controllable through 2022. Kansas City has Alex Gordon and Jorge Bonifacio entrenched as corner outfield starters, but Goodwin could perhaps supplant the struggling Rosell Herrera in center. They’ll have to figure out how to deploy those players and right fielder Jorge Soler when he returns from the left toe fracture he suffered in mid-June. Soler is likely to come back in August, Rustin Dodd of the Athletic suggests. To land Goodwin, the Royals gave up the hard-throwing Condra-Bogan, whom Maria Torres of the Kansas City Star profiled in June. The Royals signed Condra-Bogan, 23, out of the Frontier League in January, and he has since shown off 99 mph heat “without losing command of the strike zone,” per Torres. The righty has tossed 27 innings at the Single-A level this season and notched a 2.08 ERA with incredible strikeout and walk rates (13.5 K/9, .70 BB/9). It seems that Marlins infielder Martin Prado has suffered a rather significant left hamstring injury, as Clark Spencer of the Miami Herald reports. The 34-year-old has endured a run of significant problems with his hamstring muscles in the past year or so. Details aren’t yet known, but it certainly sounds as if Prado will be sidelined for a lengthy stretch. He’s owed $13.5MM this year and $15MM for the 2019 campaign. The long-productive infielder has struggled to a .169/.221/.180 batting line in 95 plate appearances on the season. The Nationals finally got some promising injury news, as they’ll send both Daniel Murphy and Brian Goodwin on rehab assignments beginning tomorrow. Jon Heyman of Fan Rag tweeted the news with regard to the former; Jorge Castillo of the Washington Post tweeted manager Davey Martinez’s announcement on both players. Murphy has yet to appear in the 2018 campaign after offseason microfracture surgery, while Goodwin has been slow to return from a wrist injury. It’s still unclear just how long the Cardinals will go without shortstop Paul DeJong, but he says he has been given a four-to-eight week estimate by the medical professionals, as Rick Hummel of the St. Louis Post-Dispatch reports. More than anything, it seems that broad range indicates that there’s not a lot of clarity at this point as to how long it’ll take to heal. All involved will obviously hope that it hues toward the earlier estimate, as the replacement options all have their warts as semi-regular shortstops. It seems the Athletics will go without reliever Santiago Casilla for a stretch. He has been diagnosed with a shoulder strain, as MLB.com’s Jane Lee reports (Twitter links). Details of his anticipated absence are not yet available, but it’s said to be likely that Casilla will end up on the DL. At the same time, he says he does not believe it’s a serious malady. The veteran entered play today with an ugly 14:13 K/BB ratio, but had allowed eight runs on only 11 hits in his 21 innings of action. Though he seemingly avoided a more concerning fate, Orioles slugger Mark Trumbo will likely head to the DL to rest his ailing right knee, as Roch Kubatko of MASNsports.com was among those to report (Twitter links). Trumbo was diagnosed with a fairly significant case of arthritis, which won’t necessarily put him on the shelf for long but also probably isn’t the best news for a defensively limited player who’s owed $12.5MM this year and $13.5MM next. He has been productive thus far in 2018, though, with a .309/.317/.469 slash through 82 plate appearances. On the other hand, it’s somewhat worrisome that he has managed only a pair of home runs and a single walk in that span. In other AL East news … so long as there are no surprises in the interim, Nate Eovaldi will finally start for the Rays on Tuesday, as Marc Topkin of the Tampa Bay Times tweets. The Yankees announced that reliever Tommy Kahnle is back from the DL, which represents a promising development given the uncertainty that surrounded him when he went on the shelf. And while the Blue Jays still aren’t planning on a near-term return from Troy Tulowitzki, skipper John Gibbons says the veteran shortstop is at least ready to begin running, as Ben Nicholson-Smith of Sportsnet.ca tweets. While the Padres had hoped to welcome back catcher Austin Hedges in relatively short order, he’s now halting his rehab after his problematic right elbow flared up, as MLB.com’s AJ Cassavell writes. It still seems there’s little reason to fear that Hedges is dealing with a real structural problem, though surely it’s frustrating for the organization that he hasn’t yet fully turned the corner. Meanwhile, the Angels provided an update on hurler Matt Shoemaker, though it mostly suggests ongoing uncertainty with regard to the root of his arm issues. As the club announced, and MLB.com’s Maria Guardado tweets, the latest examination “ruled out peripheral nerve involvement” but “showed mild edema in the forearm.” Shoemaker is also said to have undergone a bone scan. The results of that weren’t specifically cited, but it seems to suggest that the organization is looking at quite a lot of possibilities to figure out what’s really causing problems for the starter. The Rays are preparing to utilize a four-man rotation for the entirety of the coming season, Marc Topkin of the Tampa Bay Times writes, with the expectation being that the club will load up the bullpen with multi-inning-capable arms. Topkin covers a wide range of possibilities for the relief corps and details the club’s thinking behind the unusual move. The plan is to utilize a string of relievers to work the fifth rotation spot, rather than designating a single pitcher to take that job. That approach seems designed both to take advantage of the organization’s options and to incorporate some analytical lessons on platoons and pitchers facing an order multiple times. Joel Sherman of the New York Post checks in on Mets third baseman David Wright, who is still plugging away in a comeback effort that seems unlikely to succeed. He says he wants to give it everything he can so that his “head can hit the pillow and I know I made every effort to play.” But that doesn’t mean it’s easy for the 33-year-old to be a part of a team that’s likely never to put him back on the field. “The mental part of coming in and knowing you bring nothing to the table as far as helping the team get ready for the season and helping the team win, for me, is the hardest part,” says Wright, “as hard as physical part of the rehab process.” Wright’s devastating combination of injuries is well-documented, of course. Remarkably, he was still capable of productive hitting when he briefly appeared on the field in 2015 and 2016, but Wright was only able to suit up for three High-A contests last year. Speaking of lefty hitting outfielders, the Orioles came into the offseason badly needing one. The club erred in its approach to filling that need, Dan Connolly of BaltimoreBaseball.com argues. Baltimore ended up drawing Colby Rasmus back out of retirement with a deal that could actually exceed the one that Jon Jay just signed with the Royals. The issue, says Connolly, is that Jay suits the O’s needs much more than does Rasmus — and also was the desired target of team leaders Adam Jones and Manny Machado. It’s an interesting look at the team’s decisionmaking process. Bruce Sherman and Derek Jeter are still seeking additional investors for their ownership group even after being formally approved as the new owners of the Marlins, reports Jon Heyman of FanRag Sports. The Sherman/Jeter group is still looking to add about $250MM from outside investors, though Heyman notes that the league is “quite comfortable” with the new ownership group’s current financial state. Interestingly, Heyman has obtained some slides from a “teaser” email sent to potential investors in which the Marlins outline a number of “strategic priorities” for improving revenue. Among the new means of revenue to be explored are a new television contract, selling the naming rights to the stadium, new sponsorship/advertising opportunities and an increased focus on utilizing Marlins Park to host non-baseball events (e.g. concerts). In his latest Nationals Inbox piece, MLB.com’s Jamal Collier writes that he doesn’t foresee a reunion between the Nats and first baseman Adam Lind this offseason. Washington’s decision to turn down their half of a $5MM mutual option suggests that they’re not willing to pay him at a rate he may very well be able to find elsewhere on the open market. The Nats will likely utilize Brian Goodwin as a fourth outfielder in 2018, Collier notes, but Lind’s absence will make finding a backup first baseman/corner bat off the bench a priority this winter. The Phillies have named 28-year-old Pedro Guerrero, a former Dodgers minor league infielder, as their new assistant hitting coach, per a club announcement. As Matt Breen of the Philadelphia Inquirer points out, that suggests that Rick Kranitz, who was the team’s assistant pitching coach in 2017, will be named the team’s new pitching coach for the 2018 season. The Phillies have previously announced that Kranitz would be on the staff next year but haven’t revealed his role with the team. However, they’re only allowed to add two more coaches before reaching the maximum allotment and still need a pitching coach, first base coach and bench coach. As for Guerrero, he’s an outside-the-box hire, to be sure. But, Guerrero has already spent two seasons as a minor league bench coach in the Dodgers organization and has some familiarity with newly minted skipper Gabe Kapler from the pair’s time together in Los Angeles. The Nationals have made yet another move in the outfield after losing a player to injury. As Chelsea Janes of the Washington Post first reported (via Twitter), Washington will select the contract of veteran Alejandro De Aza and place Brian Goodwin on the DL with a left groin strain. To open a 40-man spot, the Nationals moved shortstop Trea Turner to the 60-day DL. That placement won’t impact his anticipated timeline to return to the active roster. He has been out since the end of June with a broken wrist but has recently resumed batting practice. While the Nats aren’t in need of wins down the stretch, given their healthy NL East lead, the club nevertheless continues to face significant injury concerns, particularly in the outfield, as it looks forward to the postseason. Washington’s entire original starting outfield — Adam Eaton, Bryce Harper, and Jayson Werth — currently resides on the DL, though the latter two are expected back by the end of the year. Michael Taylor only just returned from his own DL stint, joining summer addition Howie Kendrick, the lumbering Adam Lind, and youngster Andrew Stevenson in the current mix. That group will now be supplemented by De Aza, who had signed on with the organization on a minor-league deal in mid-June after failing to crack the Athletics roster in the spring. When he makes his debut with the Nats, De Aza will appear in his tenth MLB campaign with his seventh organization. The former White Sox regular owns a lifetime .261/.328/.398 batting line. Over his 212 trips to the plate this year at Triple-A Syracuse, De Aza has slashed .280/.368/.403. He obviously hasn’t hit for much power this year, with four home runs, but has drawn 25 walks against just 30 strikeouts. The Nats will hope that De Aza can help hold the line in the same way Goodwin has. A former top prospect, the 26-year-old Goodwin has turned in surprisingly strong numbers since being thrust into an unexpectedly significant role. In his 278 plate appearances this year in the majors, he’s batting .251/.313/.498 and has launched 13 long balls to go with six steals. Goodwins .247 isolated slugging mark and 16.5% home run per flyball rate headline a notable power outbreak for a player who had never seemingly harnessed his tools in the upper minors.